French wire is not really jewelry wire or threading material in the traditional sense. In fact, you are more likely to find them under 'Jewelry Findings' category than under wire or stringing materials. Some of you may know this as 'gimp', 'gimp wire' or 'bullion wire'. Though it is still useful today, it is less well known. Many years ago, it was a very core, useful, and important component in jewelry making. Today, it is still a well-known and useful component for all those who are into pearl and other gemstone hand strung jewelry making. And it is also beginning to make a come-back in other areas of jewelry making. Many years ago, there were less well-known nor easy way to smooth edges of the holes in beads. Gimp wire was then used to protect threads/stringing materials from the sharp edges of the beads at the clasp. Otherwise those edges would rub against the threads during wear and cut it. Gimp wire is used not just to protect the threads from the sharpe edges of bead-holes but generally, to protect stringing threads from metal loops and jumprings, from fraying, and to give the finished article a more professional look. French wire is from extremely fine coiled wire. At first glance, they look like a very smooth and closely linked fine chain. It is very delicate, soft, and flexible to the touch. 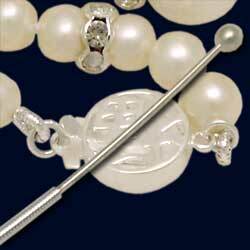 They are most frequently used with silk threads and pearls. And mainly to finish off jewelry pieces between the crimp and the clasp and/or other metal components. String your beads. Then the beading thread is taken through a suitable length of gimp, and immediately back through the bead(s) from where it came. 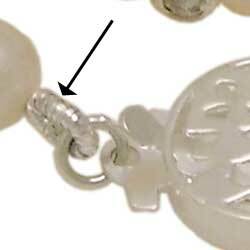 Pull tight so that the giimp creates a 'metal loop' which can be used to attach your strung beads to jumprings or clasps. You need to ensure that your stringing thread must be able to pass within the coiled metal of the gimp. And that after your 'metal loop' formed by the gimp can fit through the clasp-ring. You can read see another step-by-step on How to Use French Wire.